This is one of the easiest way of cooking my favorite vegetable: unripe Jackfruit! Truly delicious. In a sauce pan, put some cooking oil and sauté the garlic. Add the jackfruit and continue cooking for another three minutes. 3. 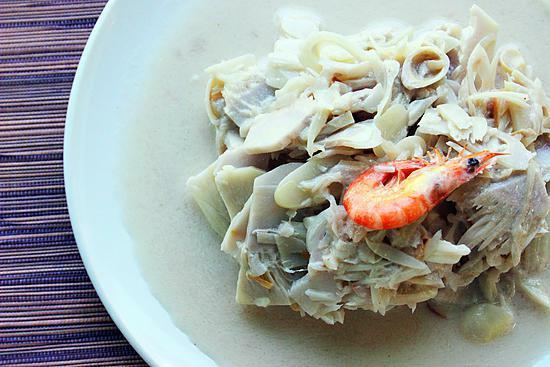 Then pour the coconut milk and put the dried fish on the top and cover. Simmer over low fire for about fifteen to twenty minutes. Stir and taste, you can add some salt, pepper and fish sauce (patis) if necessary. The chili pepper is also optional. You can add it on the top before serving. Best eaten with steamed rice. Kain na! Click the 'Add to favorite' button to add this recipe to your list of favorite recipes. 80Guest, Guest and 78 others find that it looks really good. I am from Cavite and I love cooking Filipino comfort food.